1. 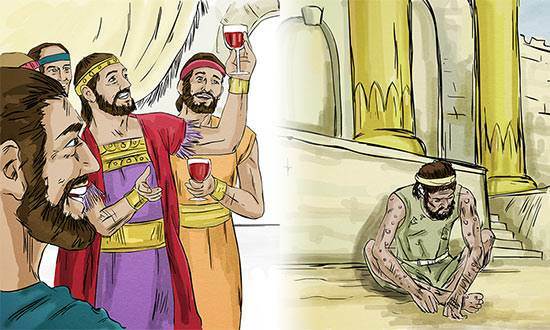 What did Jesus tell the Pharisees before telling this parable? a) That they should love their neighbor. b) That they cannot serve God and money. 2. Where was the beggar Lazarus laid each day? a) At the gate of the rich man. b) At the entrance to the temple. 3. When the rich man died where did he go? 4. What did the rich man want Lazarus to do? a) Cool his tongue with a drop of water. b) Go back and warn his brothers about the place of torment. 5. If someone rose from the dead, would people like the rich man’s brothers listen to him?